The Villas are a limited number of handsome, high-quality condominiums and European style villas build in the Midland HIlls Country Club in Roseville. Considering the proximity and membership privileges of the course, The Villas may be a golfer’s paradise but they’re also conveniently close to “real life” – things like work, shopping and entertainment. Highland Pointe is part of a redevelopment of a twelve-acre existing residential area bound by West 7th Street on the northwest, Munster Avenue on the north, Davern Street on the east and Norfolk Avenue on the south. Prior to its inception, the area consisted of 35 single family homes built in the 1950’s and 1960’s as well as a restaurant/entertainment complex. Sadly, the area had fallen into disrepair and was in need of a facelift. Approximately five years ago, the City of St. Paul designated the entire surrounding area as the “Shepard Davern Redevelopment District”. This specific twelve-acre project area was the first portion of the Shepard-Davern Redevelopment District to come on line and be offered for redevelopment. In the past five years, the project has seen a multitude of iterations. Beginning with a development that was all office with retail/restaurant it changed to partial office with a theater, a hotel and restaurant/retail, then to a primarily housing project with senior assisted living and apartments, a hotel and restaurant/retail, to the current final plan. The current plan, developed by Stonebridge and Chase Homes, which began construction in fall of 2003, is now 100% housing in four separate housing buildings. 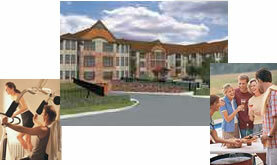 It consists of approximately 350 units of general occupancy rental apartments and 150 units of “for-sale” condominiums. This development has received enormous support from the City leaders including Mayor Kelly as part of his “Housing 5000” program, Councilman Pat Harris who has been a strong supporter of new housing for this area, and the local community leadership of the Highland Park District Council. The goal of the Housing 5000 program is to create 5000 new housing units within the City of St. Paul over four years. With the start of Highland Pointe and the rest of the Gateway Village Project, the city has reached the halfway point of their housing goal. A groundbreaking ceremony was held on December 17, 2003, and featured speakers that included Mayor Kelly, St. Paul Councilman Harris, Ramsey County Commissioner Ortega, the head of St. Paul Planning and Economic Development, Martha Fuller, and other local civic leaders. 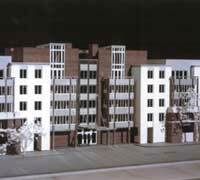 The housing buildings are all four-level structures with a fifth lower level of underground parking. There is a wide variety of unique unit plans available in each of the buildings, some with direct outside access to the adjacent streets, some to covered plazas, others that offer two-level living in both the rental and the condominiums. All units are appointed with the latest industry standard treatments for finishes, appliances, features, etc. and state of the art internet access and security technology for the occupants. Surface parking is minimized due to the large areas of underground parking. Curbside parking is provided and encouraged on all streets to promote the “urban village” feel which has been a key factor and a requirement of this development. The exteriors of the buildings will be designed in the flavor of the classic St. Paul architecture, using brick and masonry products that are consistent with the bluffs and bridge treatments that are seen upon entering St. Paul from the west. Other traditional siding treatments are provided to accent the brick along with significant glass areas giving the residents the benefit of maximum daylight within their living spaces. Vancouver, WA This mixed-use project located in the heart of downtown Vancouver provides a literal transition between the City’s transit mall and Esther Short Park, as well as a figurative transition between the town’s traditional lifestyle and 21st-Century urban activity. A public/private venture between the City of Vancouver and a private developer, it includes more than 800 parking spaces, 165,000 square feet of office space, 194 apartments and 68 condominiums. 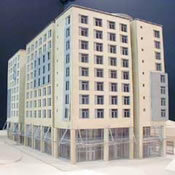 This unique project required close coordination between the city’s needs and those of the developer. *RSIC-1™ was used to control Impact Isolation Class (IIC) noise from floor to floor on 8" post tension slab concrete floors. *The RSIC-1™ was direct attached to parallel cord truss floor/ceiling members to control both STC and IIC from floor to floor in these upscale luxury condominiums. With Natural Stone & Pre-cast tile floors FIIC 63. This project was especially challenging since each ceiling contained recessed light fixtures, sprinkler heads and ceiling mounted fans. Tidewater Cove Condominiums are designed to give you the greatest comfort and satisfaction. The large rooms, specifically created to give both private and “family” spaces make for gracious, easy living and entertaining. The RSIC™ clips were used to isolate the outdoor indoor transmission class (OITC) from an adjacent train track and airport. The RSIC-1™ was direct attached to “I” joist and parallel cord truss at the roof/ceiling assemblies as well as floor/ceiling assemblies. The RSIC-1™ was also attached to the inside of the exterior wall systems to isolate the OITC noise. The RSIC-1™ was directly attached to cold rolled “C” steel joist. Most of all these luxury Condominiums contain natural stone floor finishes. The RSIC-1™ was designed into the project to enhance the Impact Isolation Class (IIC) noise isolation from foot fall noise. Mira Villa offers you a totally unique experience in Las Vegas. 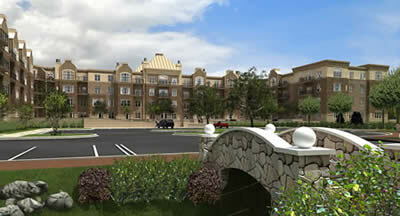 This collection of elegant mid-rise luxury condominiums provide the prestige and amenities of a resort-style community. In close proximity to the Angel Park and TPC Canyons Golf Courses and the JW Marriott Hotel & Resort, these homes bring a new and exciting style of living to the Summerlin Area. 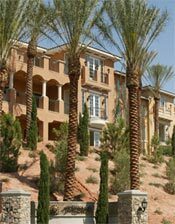 Many residences feature spectacular views of the Las Vegas Valley, nearby mountains and adjacent golf courses. Amenities include a private clubhouse, fitness center featuring state-of-the-art exercise equipment, swimming pool, spas, cabanas and outdoor BBQ areas. Home designs range from 2,071 to 3,851 square feet of enclosed area plus 265 to 1372 square feet of terraces, with two to four bedrooms, spacious gourmet kitchens, granite counters and master suites with exquisite bathrooms. These homes also feature a private 2 car garage with additional storage space. You expect convenience…you will enter your home through a private elevator, opening directly into your residence. You want beautiful surroundings…enjoy your walk along a gentle path that meanders to the pool and park area for the use of Mira Villa residents only. Whether gathering with family or friends for an afternoon barbecue, enjoying the swimming pool or fitness club, entertaining in the comfort of your own home, or playing an early round of golf with your neighbors, Mira Villa offers a better quality of life. The RSIC-1™ has been designed into this luxury condominium to ensure undisturbed pleasures to the owners/buyers of these luxurious units. The RSIC-1™ was incorporated into the floor/ceiling assembly to ensure the highest Impact Isolation Class (IIC) available. VILLA LIFE. PERFECTION BY THE OCEAN. Creating condominium villas to live up to one of the most remarkable resort oceanfront environments imaginable was the ultimate assignment. The team of dedicated designers, architects and landscape artists has sculpted extraordinary 3-bedroom condominium villas using a palette of elements native to Kolea. Sea. Sky. Lava. Air. Earth. Aloha Spirit. Take a closer look. 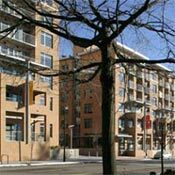 The RSIC-1™ was designed into this high quality condominium project from the beginning to the project construction. 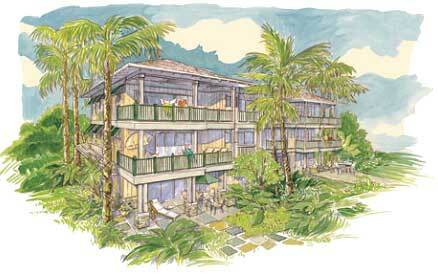 The priority was on delivery, the finest native elements and aloha experience to the owners/buyers. The RSIC-1™ was incorporated into the Kolea project to provide extreme isolation and privacy to the buyers of the Hawaiian life style….Peace, Quiet, Tranquility, Sea….the aloha spirit. FIIC 56-59 with natural stone. Garden Terrace in the Gardens Village at Summerlin is a unique gated condominium community featuring a resort-style swimming pool with lush and lavish grounds where you’ll discover an expansive spa, beautiful ramadas, an extensive BBQ area and a modern exercise facility. Garden Terrace is located near the beautiful Gardens park and also provides breathtaking mountain views. Three distinctive floor plans are offered with two and three bedroom choices. Expansive patios and balconies are designed to enhance the outdoor living opportunities the desert climate provides. The RSIC-1™ product was used to control Impact Isolation Class (IIC) noise transmission from floor to floor. 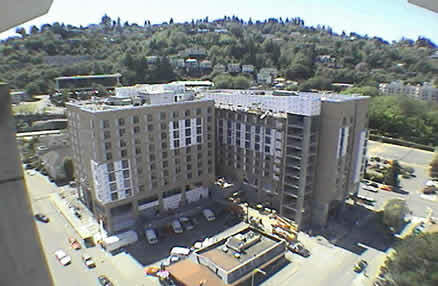 This mid market project uses pre-cast floor tiles in the high traffic areas. The RSIC products were designed into the floor ceiling assemblies to enhance the owners/buyers living experience. Desert Ridge Resort & Spa is a welcome haven in the spectacular Sonoran Desert. Here, in the heart of the Southwest you’ll find ultimate luxury, unparalleled service, endless recreation and exquisite cuisine. 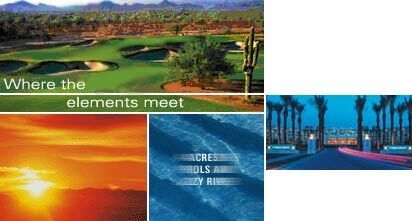 Surrounded by the grandeur of the McDowell Mountains, Desert Ridge is destined to be the region’s most exciting resort, with Arizona’s largest ballroom, a pampering spa, world-class dining and championship golf. The RSIC-1™ was used to control Impact Isolation Class (IIC) noise transmission from floor to floor in this Luxury Complex. The RSIC-1™ terminated the structure borne path where impact noise travels from floor to floor. Coronado is a gated condominium community featuring a resort style swimming pool, fitness center, luxurious spa, BBQ area and ramadas. Nestled in the Paseo Village at Summerlin near Summerlin Centre it is close to parks, shopping, theaters and restaurants. Convenient freeway access allows for easy travel to the airport, strip or downtown. Three spacious floorplans are offered with expansive patios and balconies. These two and three bedroom homes include granite kitchen countertops, built-in oven and cooktop and private garages. The RSIC-1™ is used to control Impact Isolation Class (IIC) noise transfer from floor to floor. Even in high traffic areas where ceramic tile floors are used, to appeal to the satisfied buyers. This 212,095-square-foot, 10 story, mixed-use development adjacent to the Portland State University campus is the largest student-housing project to be built in Portland in the past decade. The concrete Post-tensioned structure will provide 384 studio apartment units on eight floors, 15,230 square feet of retail space at street level and 17,910 square feet of classroom space at the second level. The building also serves the University’s goals for sustainability. The building is designed to meet LEED’s Silver standard, with such sustainable features as an 18,000-square-foot eco-roof, the largest in the city, high-efficiency fixtures and sustainable harvested materials. RSIC-1™ was used to control Impact Isolation Class (IIC) noise from floor to floor on 8" post tension slab concrete floors. The RSIC-1™ clips reduced the cost of this project by eliminating the need for floor finishes, allowing the owners to use stained concrete as the finish. The RSIC-1™ isolated the foot fall noise at the ceiling below the concrete slab. The RSIC-1™ clip also eliminated the high labor expense of installing a dropped ceiling below the slab. You’ve seen their pictures on CDs and music videos, you know their songs by heart, but nothing beats the human contact of a live show! World class entertainment alone would be reason enough to bring your family vacation to Branson, Missouri… There’s something for everyone, on-site and at your doorstep. Step into the fresh Ozark air and let the focus be on fun and a host of amenities sure to bring the brightest of family smiles! 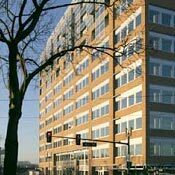 This mid-market time share complex was looking for improved noise control from room to room. The wall design originally proposed and used, under performed the standards set forth by 15 STC pts. The rebuilding of the walls using the RSIC-1™ products met and exceeded the owner’s requirements for noise transmission from room to room. Download printer friendly file format – PDF.